I have just bought 2 Kaoss pads! Im loving them… with some reservations/wishes! I have NOT been so interested in them before now, as.. 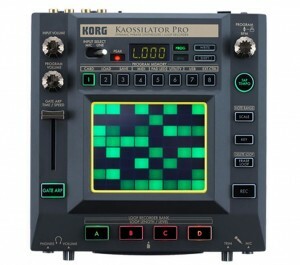 But along comes the Kaosscilator PRO. And then the Kaossilator QUAD. I got instead of the KP3, cos I was interested in 4 simultaneous effects, as I wanted something to put right on the end of my chain, that EVERYTHING, guitar, guitar synth, loopers (3) and the Kaosscilator would go through. 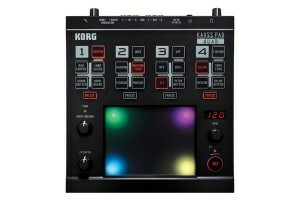 After a few days play I have a few things I would like Korg to take note of, and CHANGE. 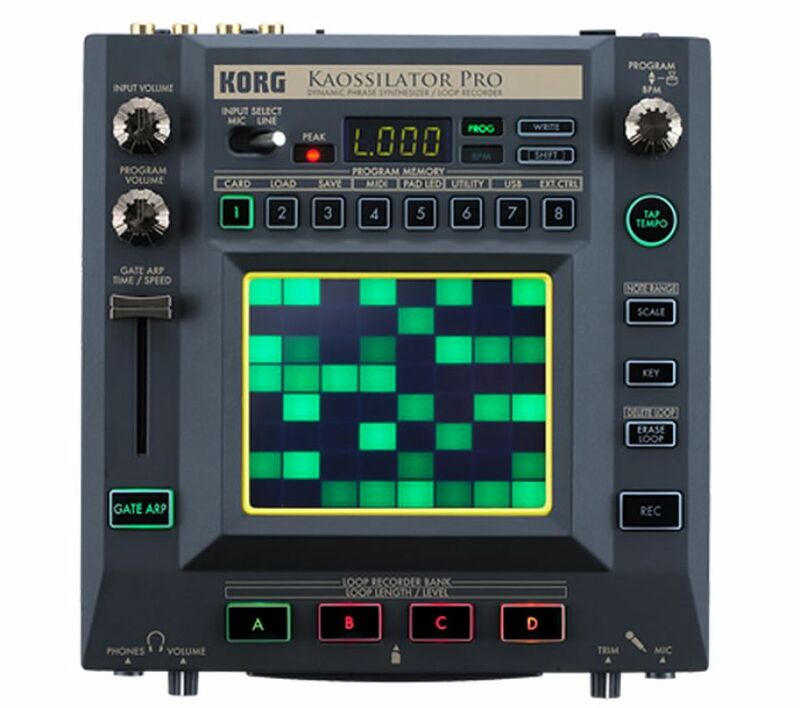 In the Kaosscialtor Pro, that can send out a new firmware update, as a fix, with the Quad, it will have to be another version of the box, as the Quad has no midi or USB.. or nutting, so no updating there (See gripes below)!! 2. Need a quicker way to delete all, to clean slate… currently its Hold Del, press on all tracks then fumble to the little flashinh write button… whats wrong with a long (2 sec) press of Delete? or Delete AND REC for 2 secs? 3. Hissy on the mic channel when you are NOT kaossing, might just be my mike, but why is the sound OK when I am effecting it? 4. The main criticism is something I wouldn’t have known about if I hadn’t read some Kaoss forums. Apparently the ORIGINAL Yellow or pink one, apparently had a feature where you could get ARP PATTERNS… where are they on the PRO version? Never remove a feature for the PRO version… ADD features! If this can be implemented, the ARP PATTERNS could be sorted into banks, like the sounds, but maybe you must press ARP while you press a bank to access them?, once pressed, the ARP button could flash showing you are in pattern select mode, you select one, and then its loaded, and maybe the slider selects variations on that Pattern? 1. Obvious but… no midi!! No midi synch (Tho I must say that’s not a prob as it syncs wonderfully to input audio, and sometimes its nice to take it off auto sync and hand crank the bpm button.. cool) NO the real reason, is that there’s no update possible, so what we have.. we are stuck with! 2. Why OH WHY??? Cant they have kept the KP3 “record touch” function (or whatever its called). Being able to record your finger movements and play them back would ahve solved for me the “well you are a guitarist” thing… BUT.. I hear that on the KP3 its not possible to sync to the beat via midi or audio, this is silly, I would LOVE to be able to record a finger motion and have that motion “quantise” to the loop. Are we sure it doesnt do that? Ill have to borrow a kp3 to check… Again.. why TAKE AWAY features?? 3. theres no 3rd gripe! Overall I LOVE thse 2 boxes, I just need to memorize 200 patch numbers! Oh dear, it looks like the time has come to selling some stuff. I have finally sent the cash off for my second Echoplex Digital Pro. Its a big day! I am happy! I dont think it will arrive in time for me to use it for the gig next week, but lots of multiplexing is to be done at Mu this year Methinks…!! !